Your space is your little part of the world. What can you do to make it a little more alive? Plants are an obvious step in this direction, but bad luck and bad experiences can intimidate the new gardener. 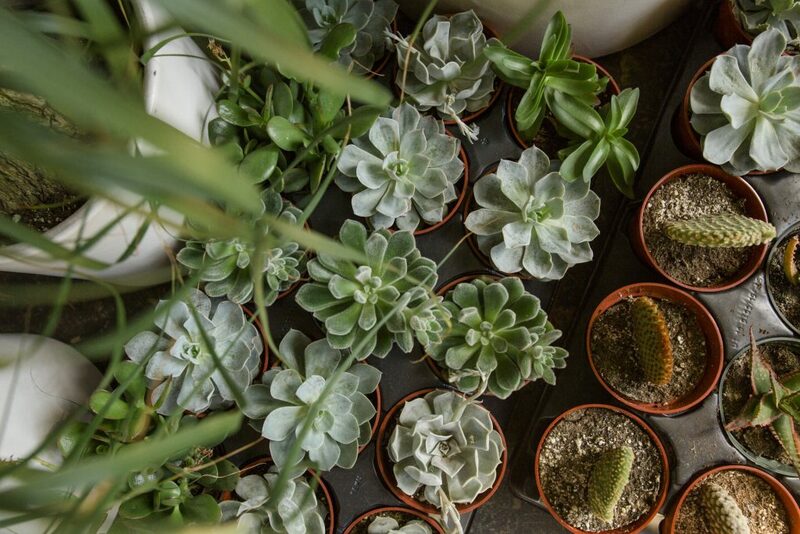 Fortunately, plant stores and garden centers around Columbus help make greenery more accessible to everyone, ranging from absolute beginners to gardening experts. Here are a few local options to help bring springtime blooms into your living space and gardens. Stump is aesthetically designed around the plants it sells. No ceramic creatures sit on the shelves, no butterfly magnets stick to the wall, even the soil is tucked away. The store is just plants in pots, providing inspiration for how the pieces on display could fit within a home. Kellett and his wife, Emily, first opened Stump five years ago. 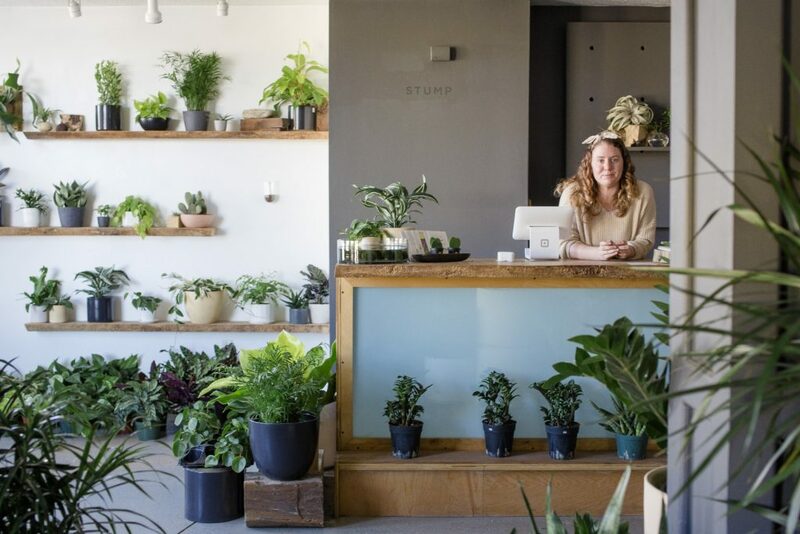 While Emily was studying industrial design at the Columbus College of Art and Design, she started doing research on the horticulture industry, and with Brian, was inspired to open a plant store targeting millennials. 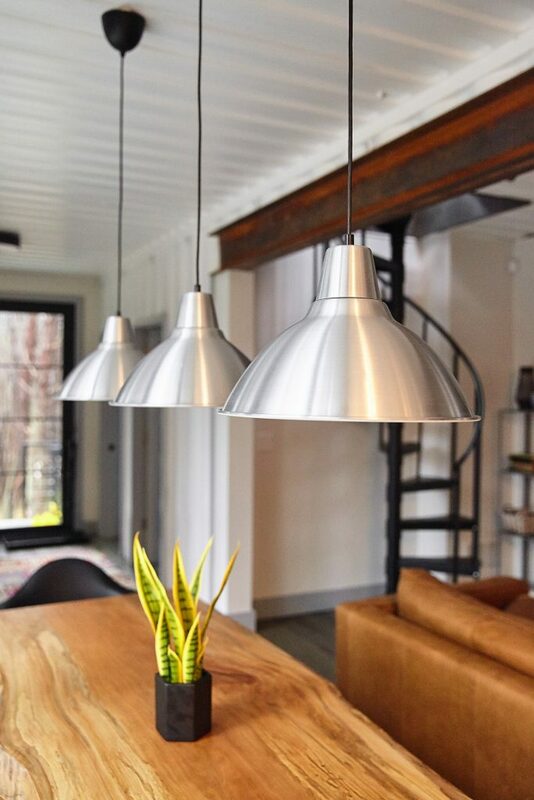 Brian also studied and later taught at CCAD, and together they applied their artistic background into the aesthetics of the store: a minimalist, greyscale design that showcases the vibrancy of the plants they sell. Because Stump focuses on houseplants, most of the species it sells are desert and tropical plants. It’s a great starting point for beginning plant parents, says Brian, especially since Stump provides personal service, and the experience can help prepare someone to be more confident in going to a larger garden center. “It actually works really well because people build up their confidence at Stump and then they’re like, ‘Oh, now I can go to Oakland or Straders and I know what I’m looking at. I know what section of the garden center to look at,’” Brian said. The Strader’s Garden Center on King Avenue is small. 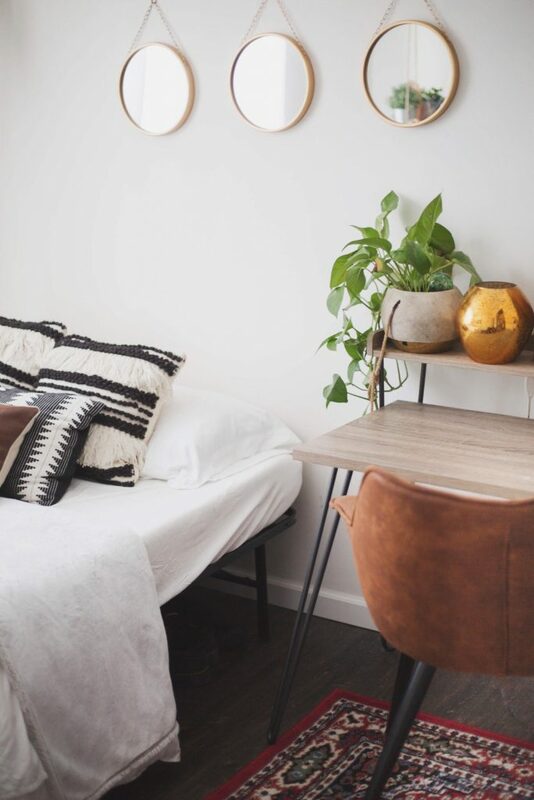 Of course, it has all sorts of plants perched from floor to ceiling, including currently the trendy air plants that can grow almost anywhere in a house. 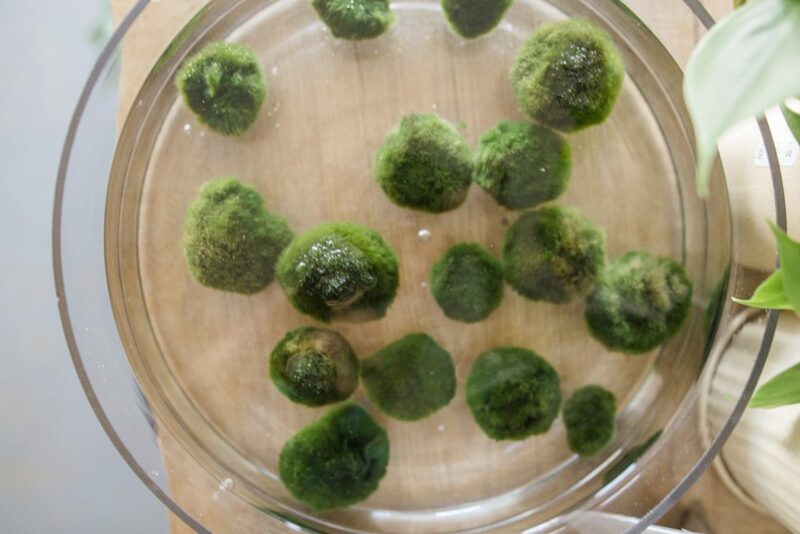 But it’s also a treasure trove for quirky yard and house decorations to accompany the greenery, while also providing the tools needed to tend to the plants and keep up with yard work. 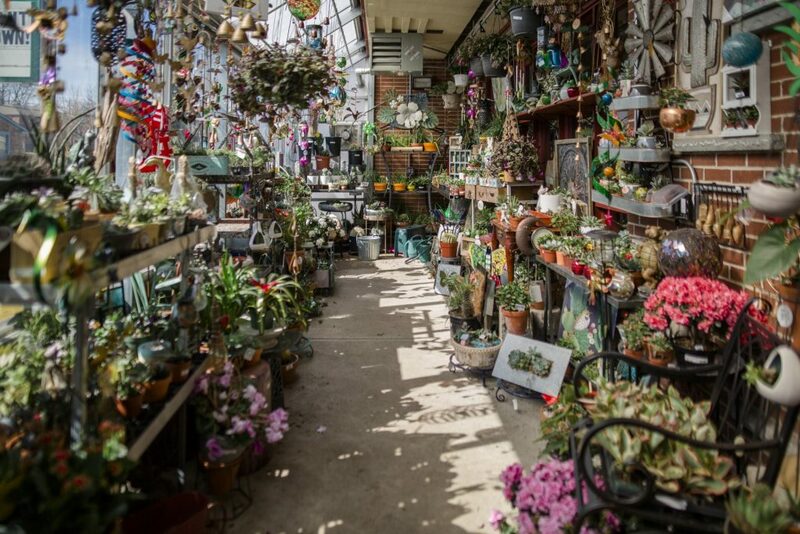 Strader’s Garden Centers is one of the most iconic garden stores in Central Ohio. Jack and Ruth Strader opened the first Strader’s Garden Center more than 60 years ago on King Avenue. Now, it’s grown to eight total locations through Central Ohio, some of which look very different from Stader’s current shop in Grandview. 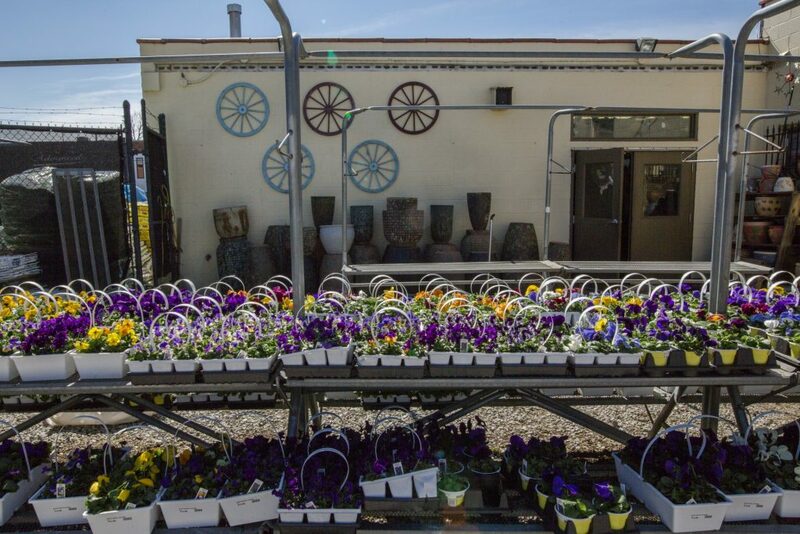 Along Riverside Drive, near Dublin, Strader’s has an expansive greenhouse with rows and rows of plants, along with a selection of outdoor decor, making it a one-stop shop for all landscaping and gardening needs. 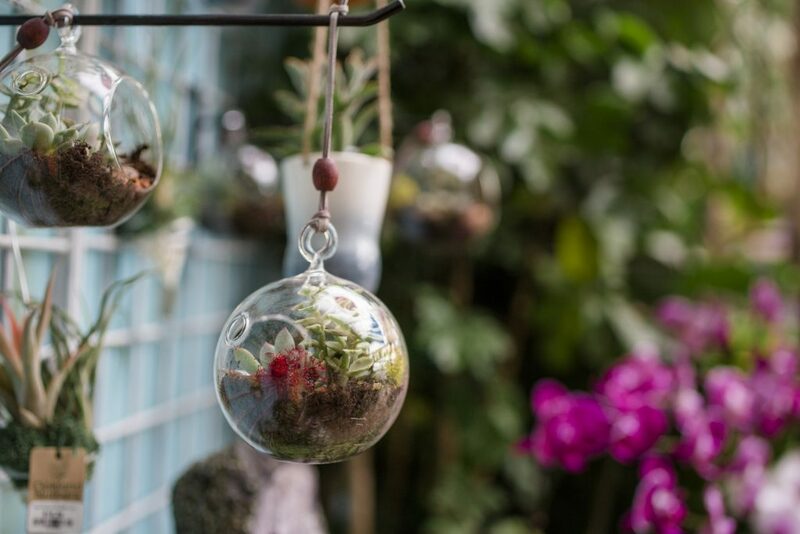 They offer fairy gardens and bird houses, along with seasonal plants and flowers to create a garden center with pretty much everything a gardener needs. 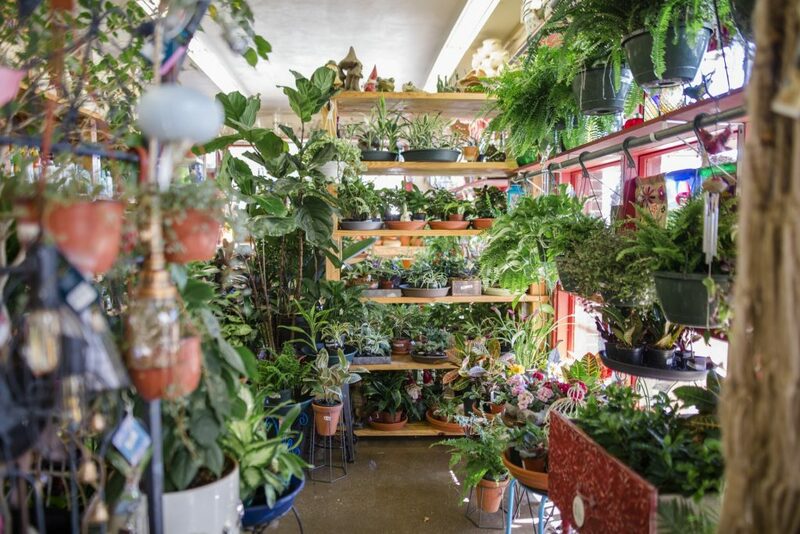 Taking gardening and landscaping even one step further is Oakland Nurseries, which has wrap-around services and products for everything gardening and landscaping-related. 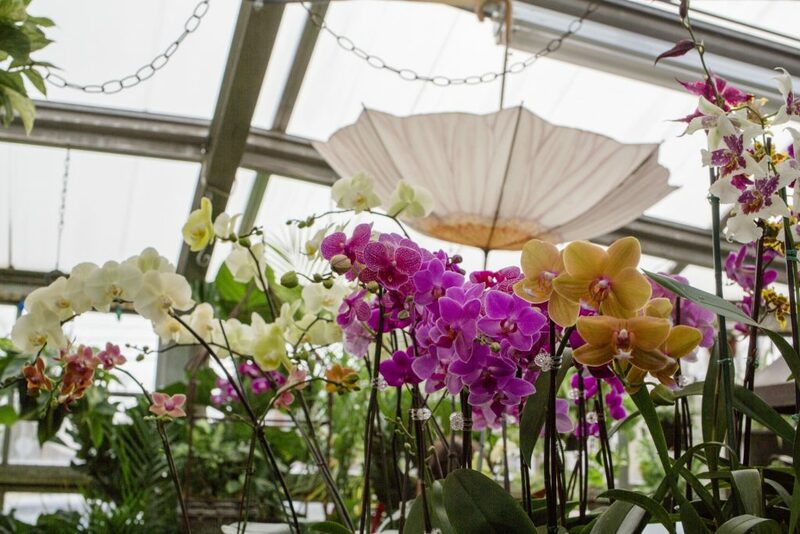 Back in 1940, Gustav and Bertha Reiner founded Oakland Nursery in Columbus, and 10 years later they moved the business to its current Oakland Park Avenue location. The Reiners spent 40 years in their home in the North Linden area, and since they died their house has been transformed into a meeting and education space for green organizations in the area. 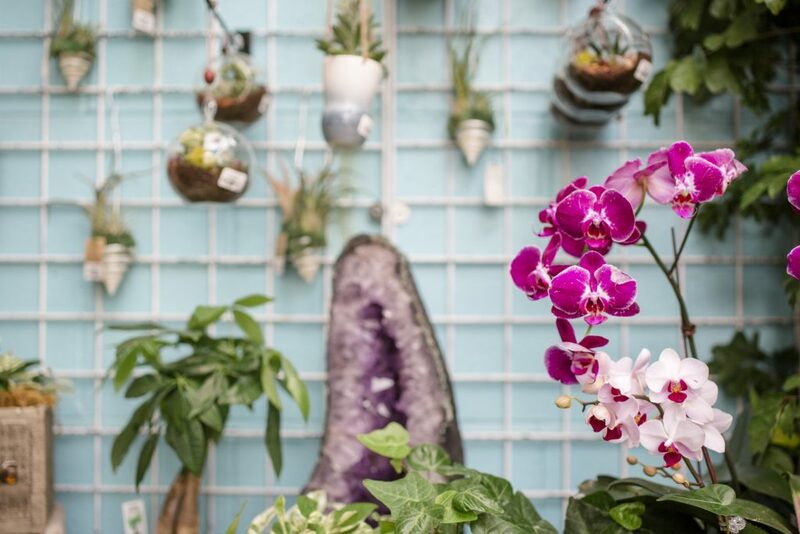 With almost 80 years of experience bringing plants into houses, businesses and public spaces around Columbus, Oakland Nurseries has plants for every person and every occasion. Inside their garden centers, like one would expect, are seemingly endless variations of flowers, shrubs and trees, including the charming pawpaw tree, which bears America’s largest native edible fruit. This year, Oakland has over 300 varieties and over 10,000 rose plants available, the largest plant selection in Central Ohio. But the garden center team provides much more than plants. They also do landscaping, irrigation systems, lighting, streetscapes and holiday decorating. 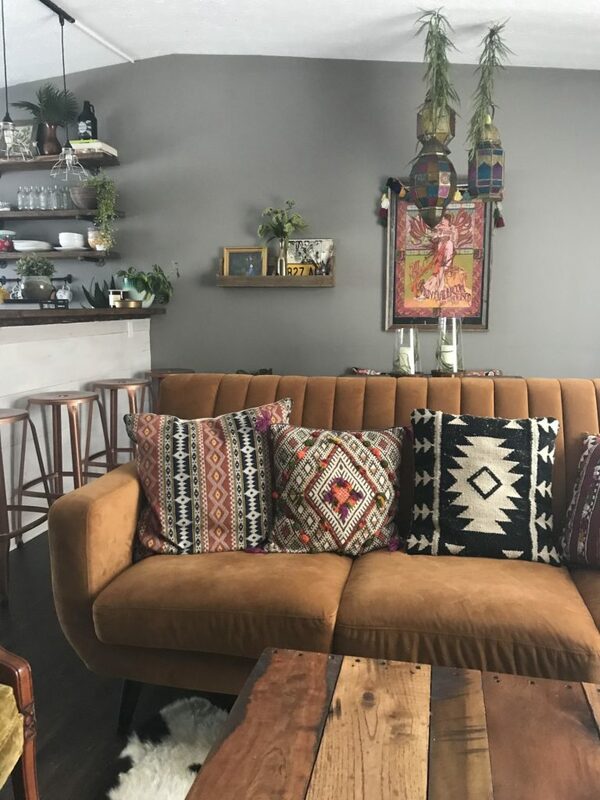 To get people excited and educated about plants, Oakland hosts programs like herbal mixology cocktail classes and “paint and sip” classes where participants make art and drink mimosas. Holiday weekends in Hocking Hills offer ample opportunities for outdoor adventure. 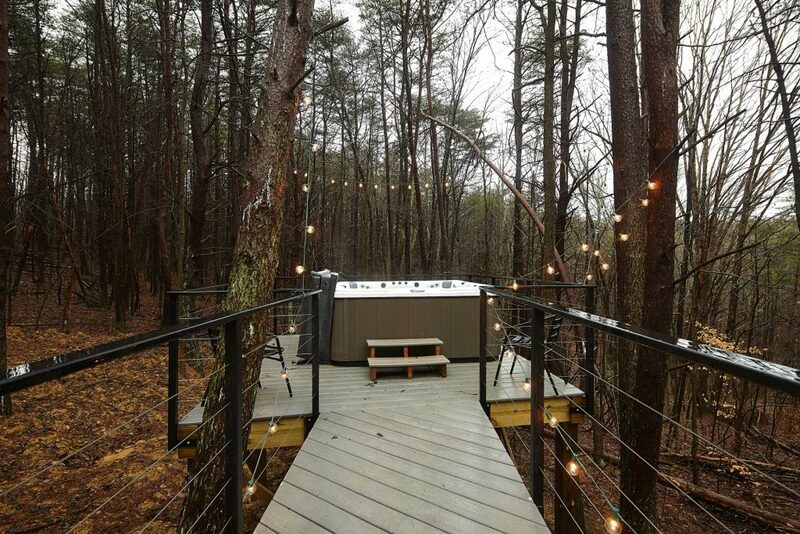 But Seth and Emily Britt’s first overnight stay at the site of their modern take on a cabin in the woods was more than either anticipated. 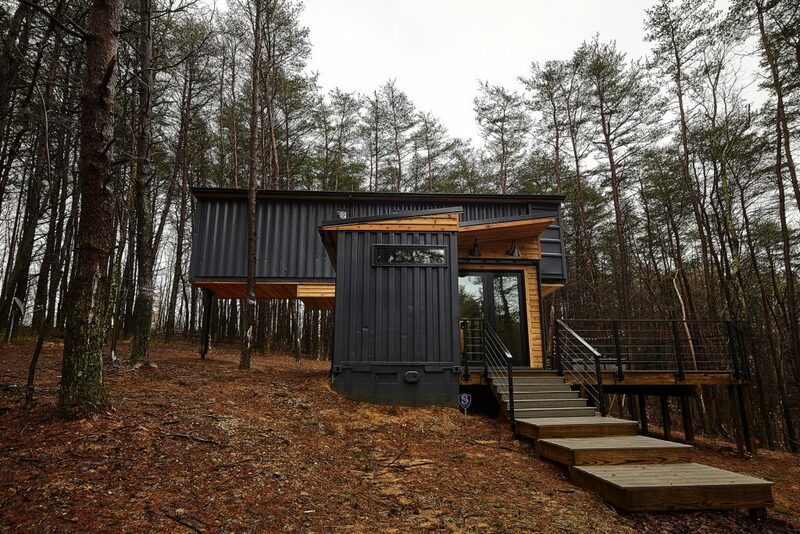 The family of four (now five) had recently closed on the lot after an exhaustive search for just the right spot to build what would become known as The Box Hop, a home away from home built from three enormous steel cargo shipping containers assembled in gravity-defying fashion. 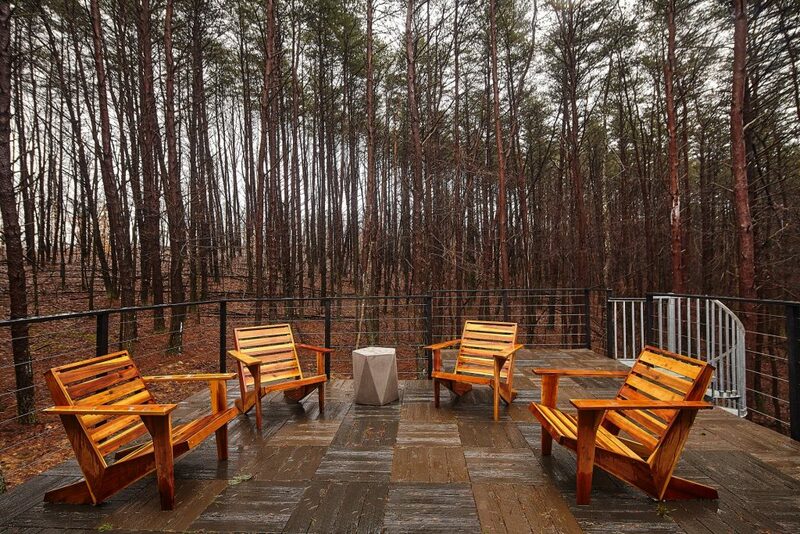 The sleek aesthetic and amenities break from the more traditional rustic retreats just a short drive from Columbus. Exceeding expectations was always the plan. Getting rescued from rising flood waters in the middle of the night was not. When the waters receded, the Britt family found one of the shipping containers had actually floated downstream more than 300 feet into their neighbor’s yard. Rainfall and runoff would continue to plague the construction process. But now after a decade of dreaming, years of planning, and months of delays, their unlikely abode was finally ready to share with friends and strangers alike. Seth was already pretty handy, having rehabbed a duplex in Olde Towne East. The couple’s first home was a HUD house in West Jefferson that had been vacant so long it was overrun with raccoons. Neither was easily put off by hard work, or a little wildlife. A growing family drew them back to the city, but never dampened their dream. Emily had earned her real estate license along the way, and had a natural knack for design. Her father works in environmental construction, so those insights informed and inspired her striking silhouette for The Box Hop. 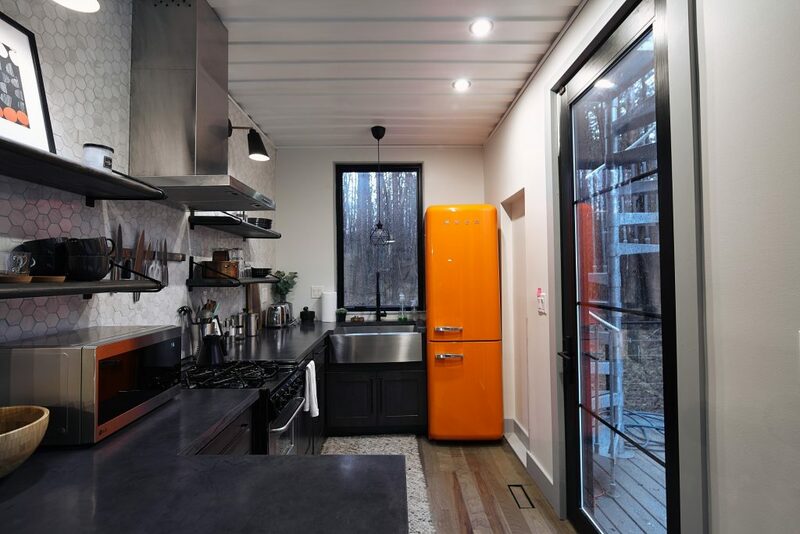 But the functionality grew entirely out of the family’s personal connection to the perennial destination for hiking, rock climbing, and scenic serenity. Much of the meteoric appeal of AirBnB is its authenticity over another ho-hum hotel room. 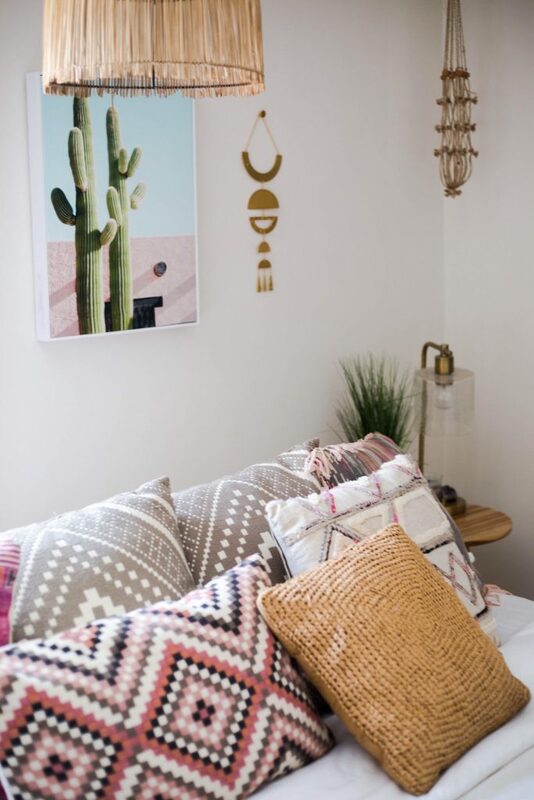 But trying to make a place feel more like a home can easily end up a hodgepodge. 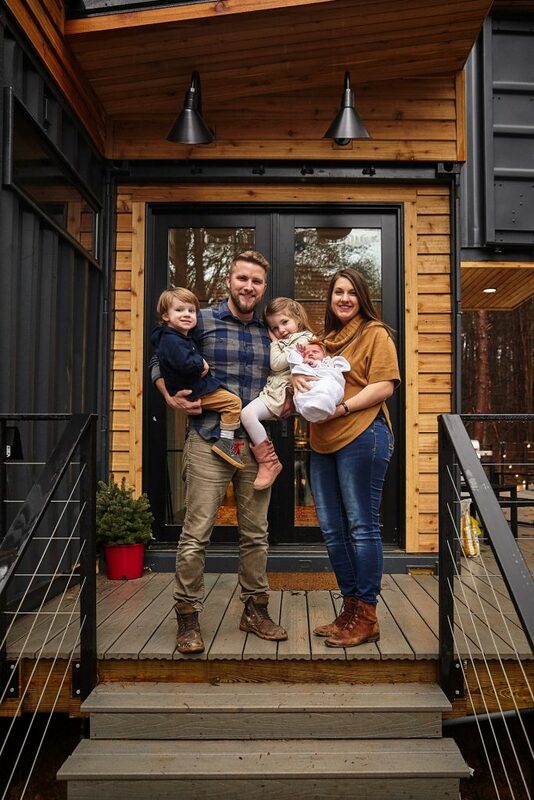 The Britts sought the right balance, inside and out, by creating a simple and sophisticated stay unlike anything else in the Midwest. 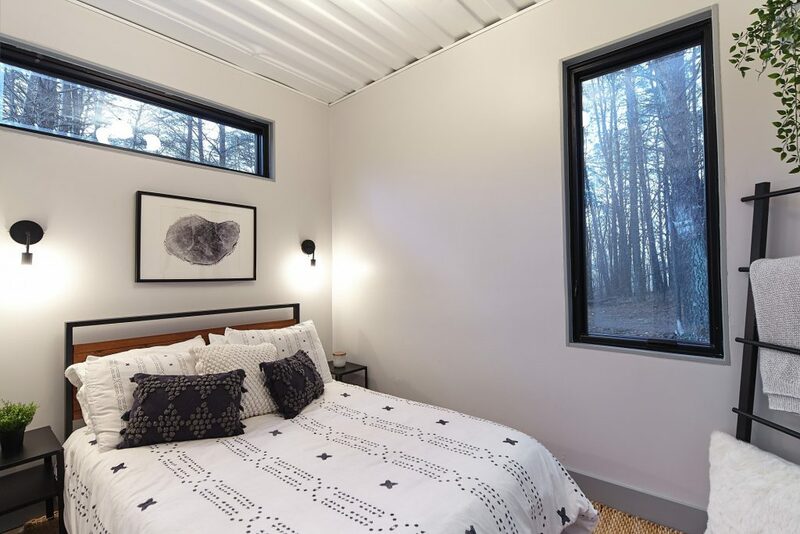 The offset configuration of the two lower containers opened up a surprisingly spacious entertaining and dining area with a private bedroom and well-appointed kitchen at either end. 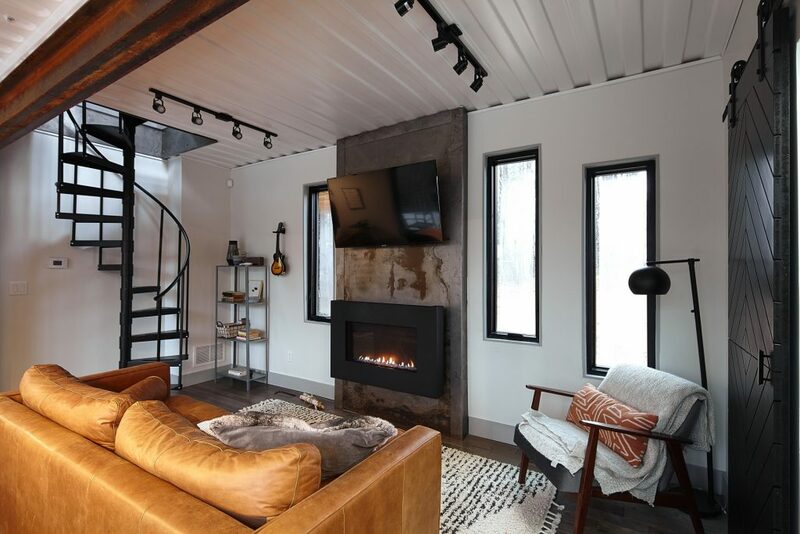 The central spiral staircase leads to the second story patio and rotated third container with wall-sized windows at either end that blur the barrier between the bedrooms and the forest that surrounds them. The result is stunning and unmistakable. The steel and glass that should contrast with the terrain mysteriously complement it. And at the right time of day, the reflection of the pines in those oversized windows makes what remains of the structure almost disappear into the tree line like postmodern camouflage. 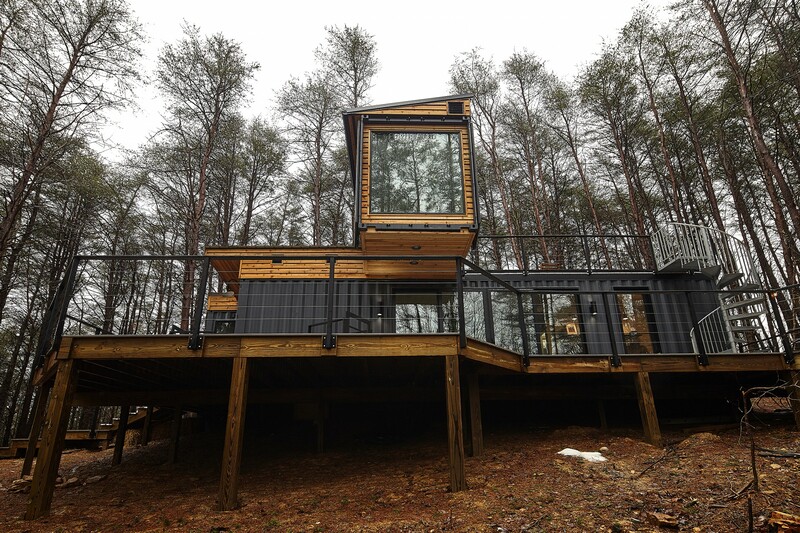 If you somehow combined Henry David Thoreau’s reverence for the natural world with Frank Lloyd Wright’s esoteric style, it would surely look a lot like The Box Hop. 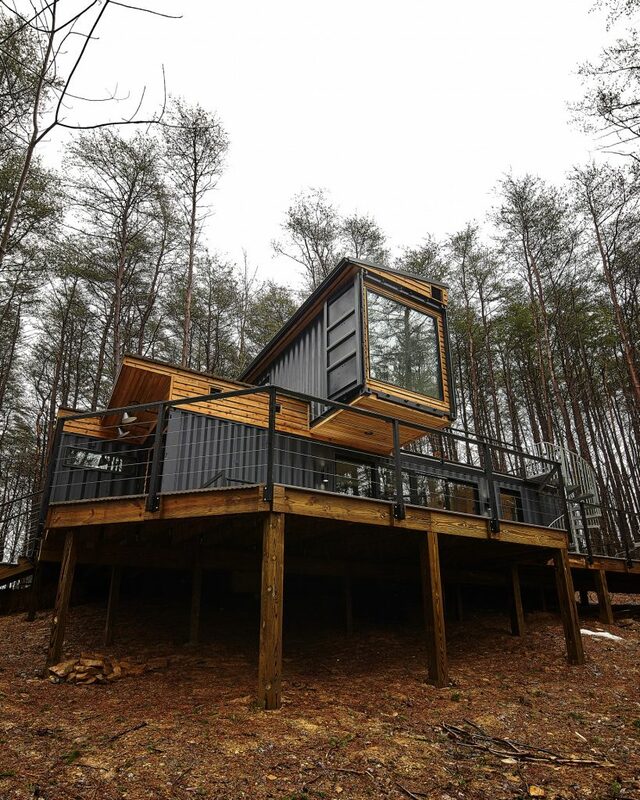 It’s Walden Pond meets Fallingwater. 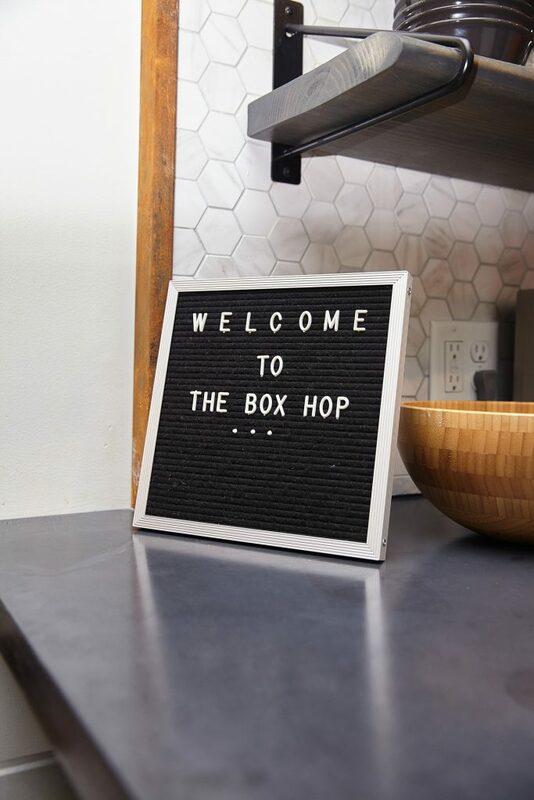 Anticipated additions to The Box Hop include suspended seating and an outdoor shower to complete the existing patio area and hot tub, as well as a large-scale mural on the exterior that references and reinforces the emerging brand—all elements that were deferred due to construction delays. The couple coyly hinted that another container getaway isn’t out of the question. With more than 18 acres available, the additional location would offer the same privacy as the original, but with its own unique charm and character. Hannah Johnson is a photographer with an eye for vintage color. 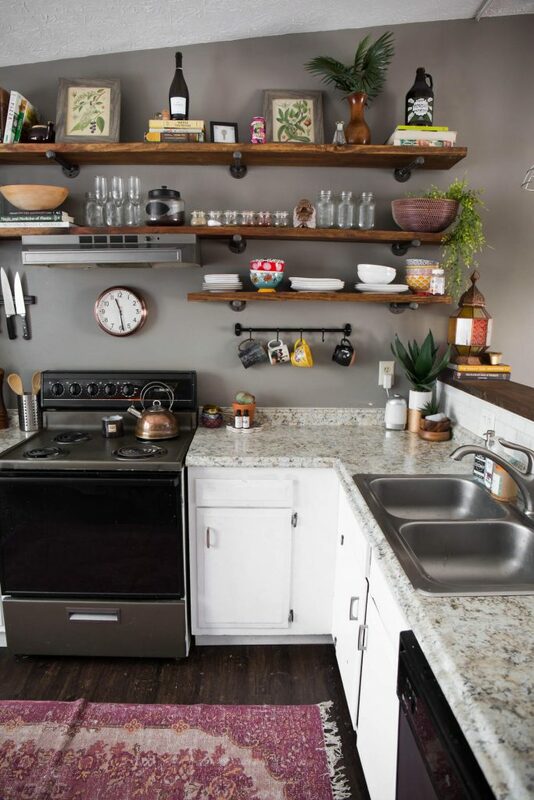 Her eclectic home was featured in an article on the popular home design website, Apartment Therapy. (614) caught up with her, only to find out that she had relocated her cache of cool to the capital city. 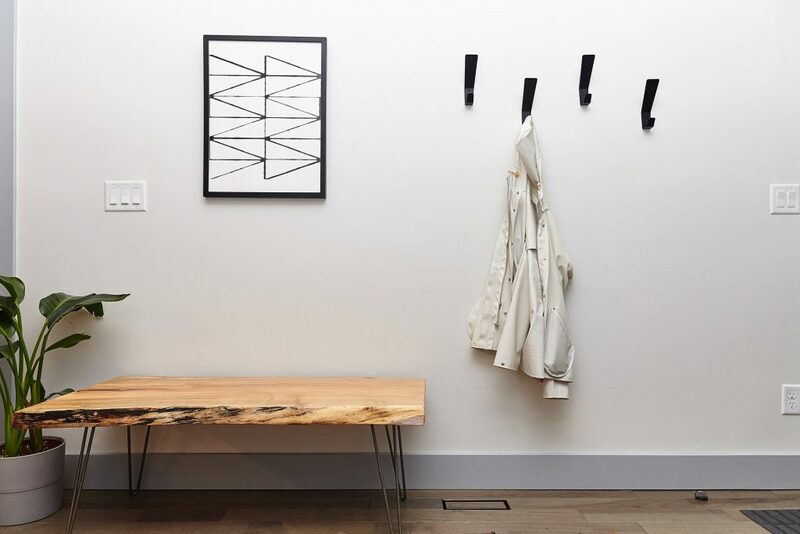 Turns out, it’s the style that makes the space—not the other way around. Johnson takes us on a tour of her tasteful time machine, and tells us where she finds inspiration. 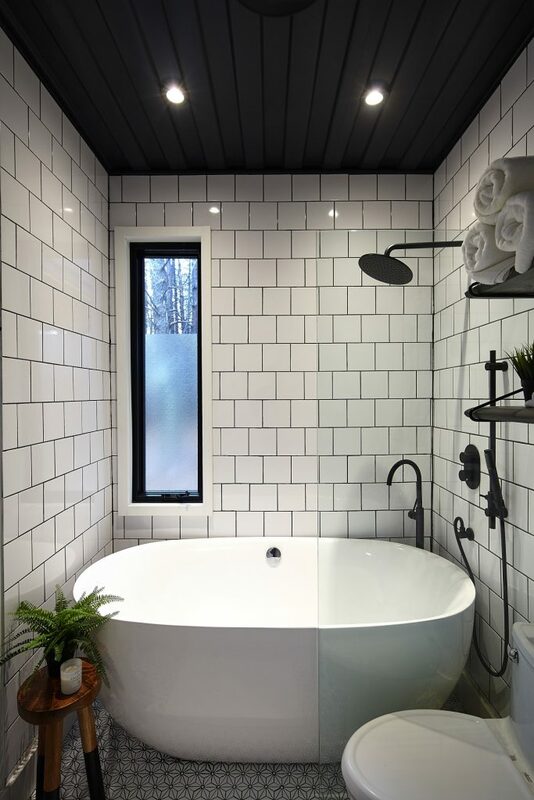 What would you call your home style? 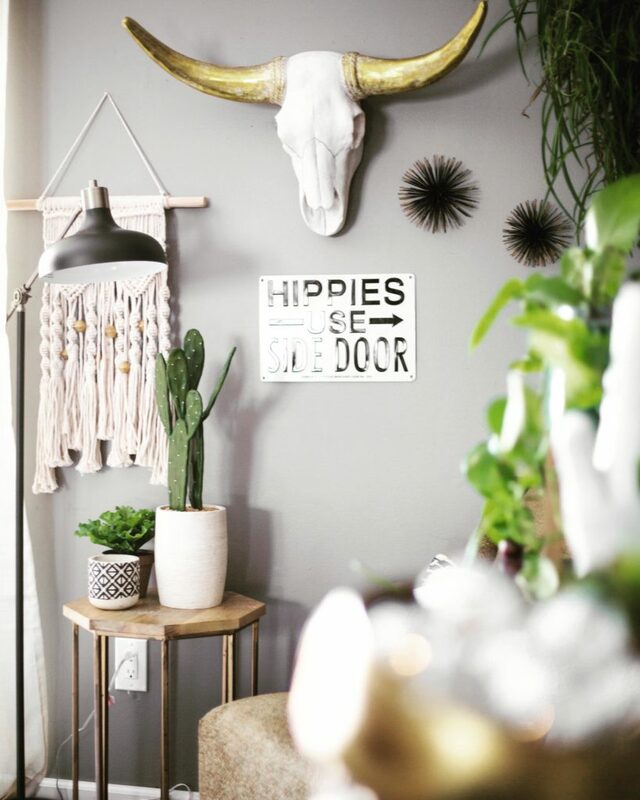 I consider my decor style trendy/bohemian. 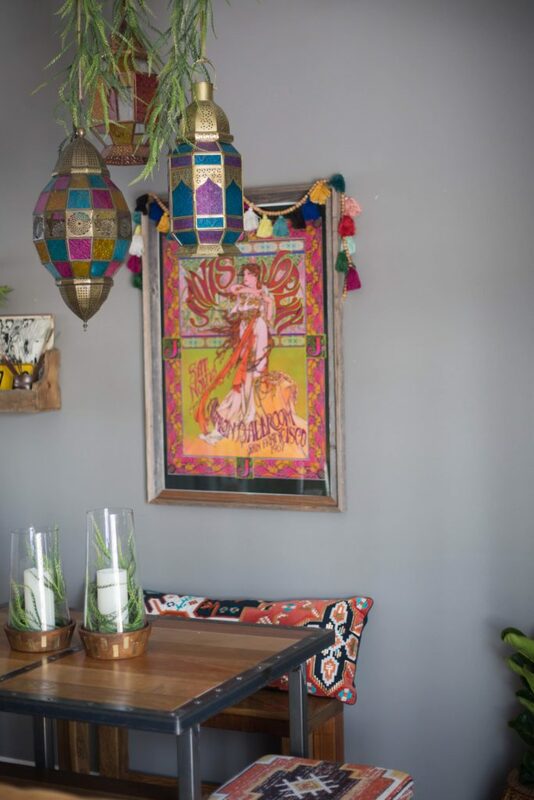 I love the eclectic look of boho design, but as much as I do not want to admit, I am drawn to popular and current design elements. 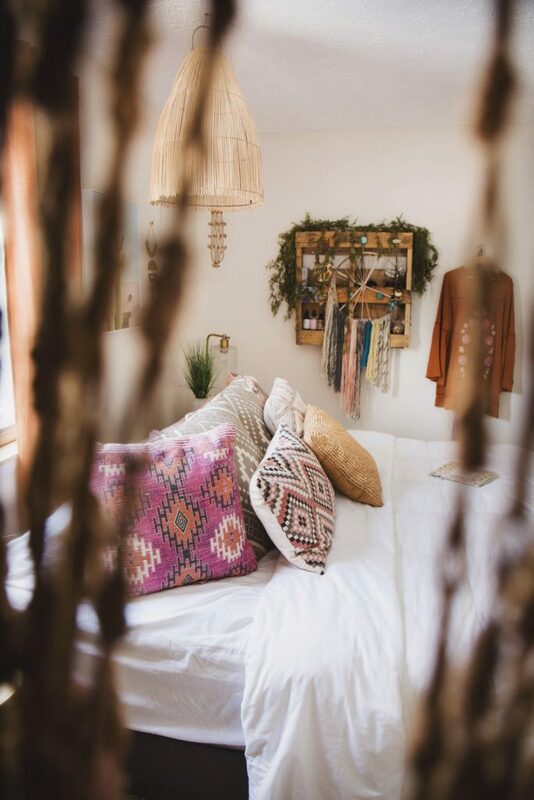 For example: natural wood furniture and macrame is so in right now, but it appeals to me and vibes with my style. 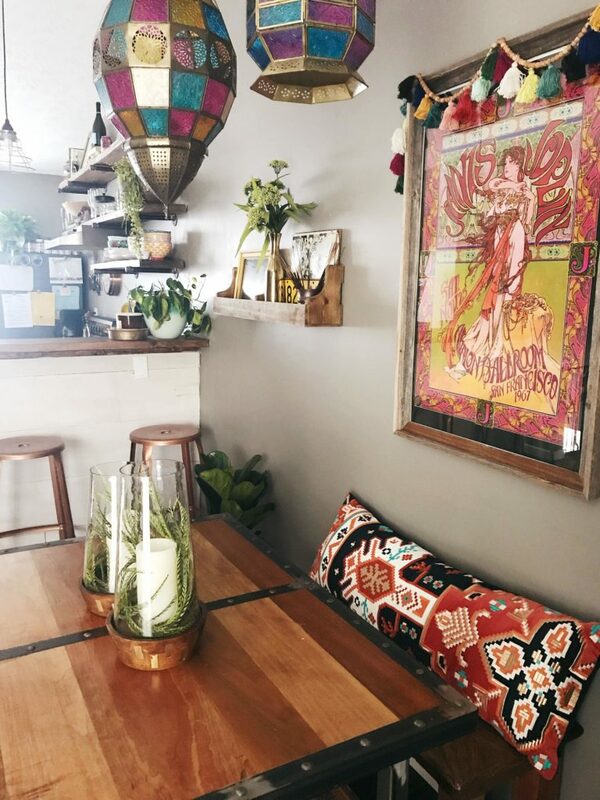 What are some of your favorite items in your home? My dad is a wood pattern maker and has built quite a bit of our furniture, my favorite being our coffee table. I love that everything he has built has come from my rough draft ideas and he brings them to life. I hope to pass a lot of it down to my daughter when she is older. Can you tell us some of the places you have found your items, or places you like to shop? I would love to be the queen of thrifting and acquire all of the mid-century modern furniture and decor with history, but it does not fit into my schedule. 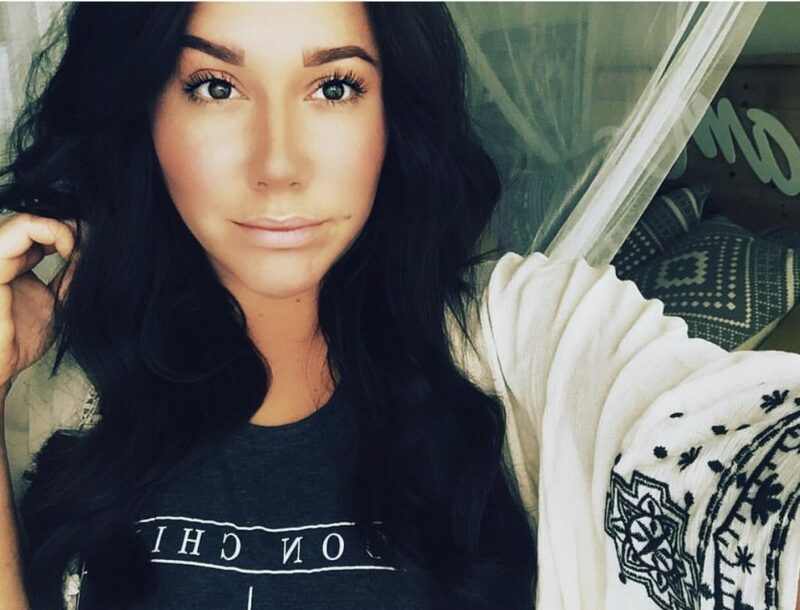 I rely on stores like HomeGoods, TJ Maxx, and World Market to achieve the boho/world traveler vibe. 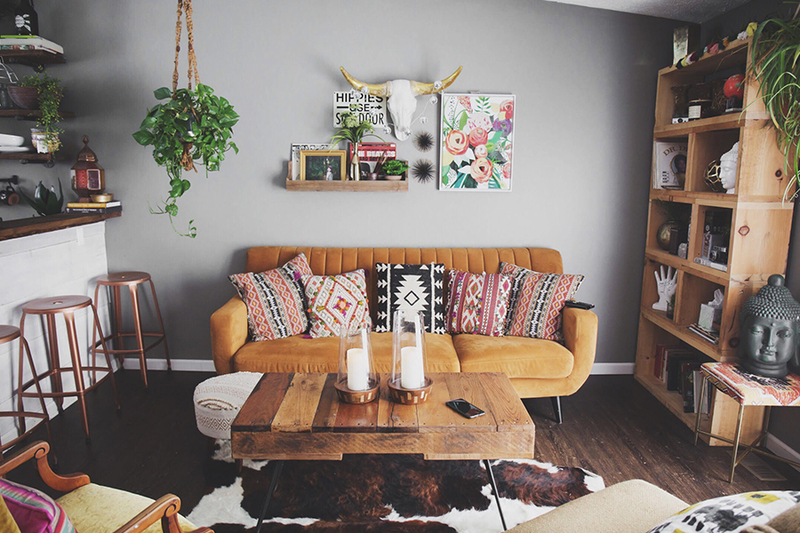 What does your decorating budget look like? Well, I am an independent photographer and my husband is a chef, so I definitely decorate on a budget—which I think a lot of us do. 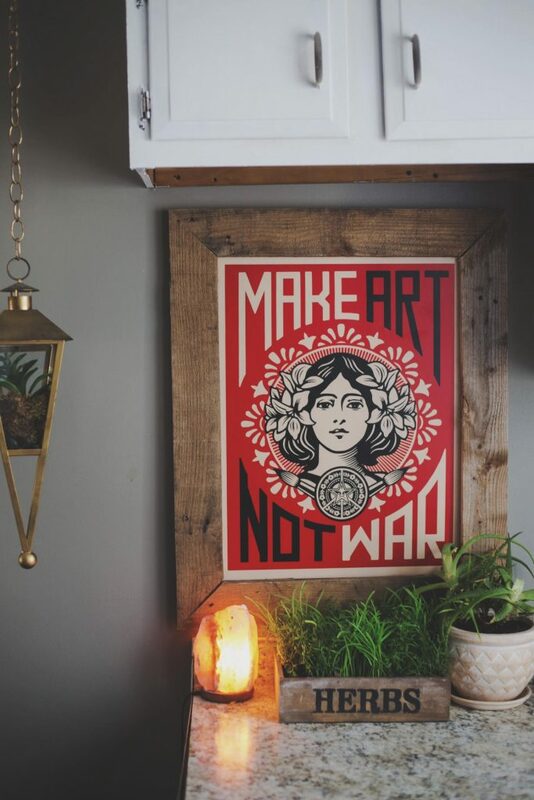 However, I prefer spending my extra money on home decor. It is my top priority to make the interior of our home bright, warm, and inviting. I spend most of my days editing at home, so it is very important to me to have a creative space where I can relax and also be inspired to create. 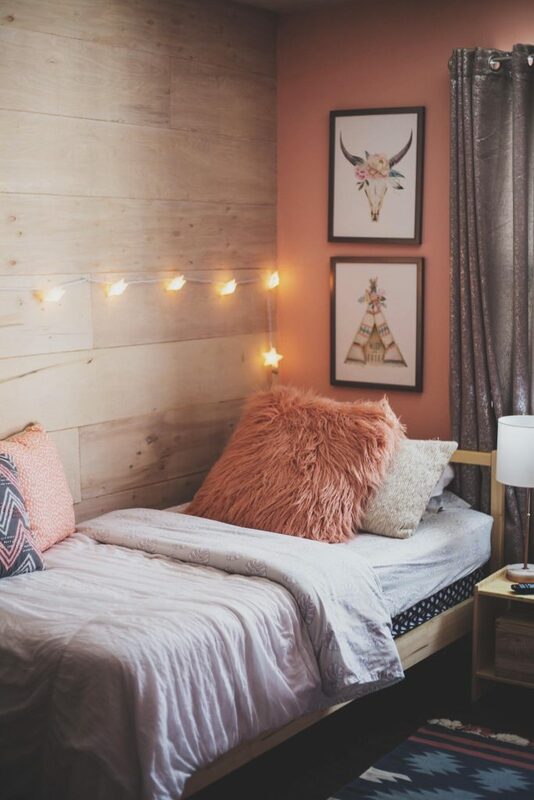 How do you keep your look from appearing chaotic, while using color and being eclectic? Easiest question so far. I am such a neat freak. I literally spend 1-3 hours a day cleaning so I am very aware of what I bring into the house because that just means there is more to clean. 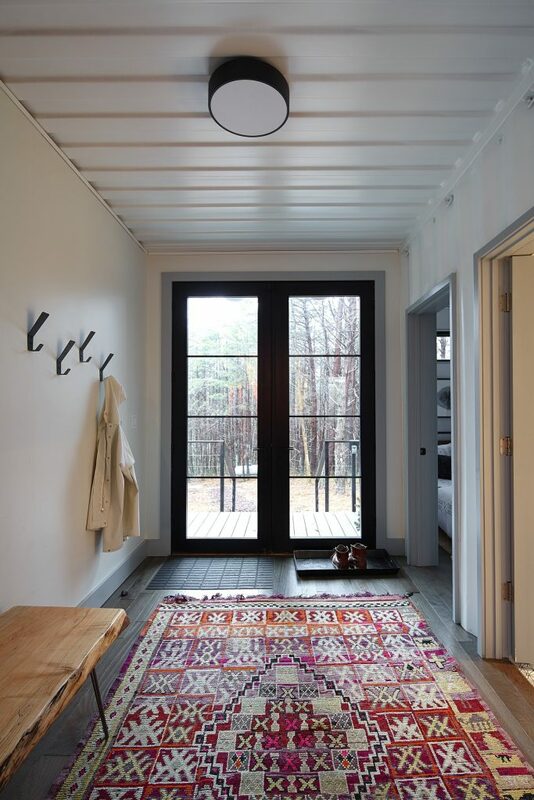 What inspires your design style? My mom and I are very close. She grew up in the ’60s/’70s so I was raised on The Beatles, Janis Joplin, and so on. I really fell in love with Woodstock in particular and just the lifestyle that went along with it. Not to mention, my mom could give Martha Stewart a run for her money, so she is always helping me with DIY projects and decorating. 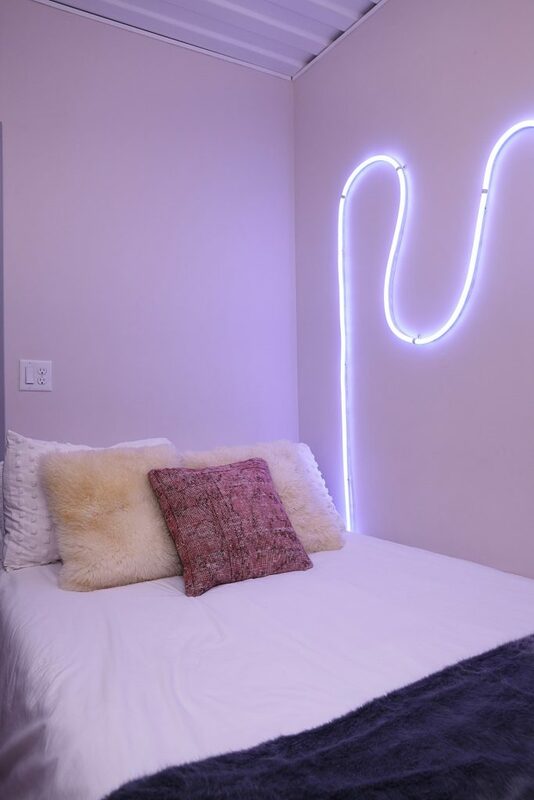 If you could change anything about your interior with the wave of a wand, what would you change and why? We moved into a bit of a fixer-upper this past fall and I was a little too ambitious in assuming we would have everything updated by fall of 2018. I have come to realize that was not realistic. So if I could wave my wand, I would have all of my floors and cabinets finished in stencils and emerald green.